Start Menu 8 is specially designed for Windows 8. It offers a perfect solution for users who work with Windows Start Menu all the time and are not accustomed to the new Metro start screen in Windows 8. 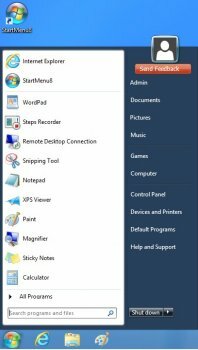 This smart tool brings back both the start button and Windows Start Menu, and offers the option to skip Metro start page, allowing users who only work on desktop to boot to Windows 8 desktop directly. It's the best start menu replacement for Windows8. This was good initially ( small and efficient). Now getting bloat with no major benefits. 3 stars. to the people with lots of ads installed.. maybe you should learn to read what's in the installer instead of clicking NEXT NEXT NEXT all the time.. I've used it for like 8 months and have not yet seen any ads.. there are checkboxes clearly visible that lets you opt OUT of installing any of that other crap.. Personally I "like" Start8 by Stardock more, but I keep having issues with the menu being just white blank space.. so I use this instead..
IObit = Nope, way to much bad stuff in the backpack, would not touch this with a ten feet long pole. There is way better programs out there. One word, classicshell. Like most IObit trash ware this is full of sneak ware, pop ups and other garbage. can't believe they ever even removed the start menu. this is great to sort that out for ya. Works but will take over your desktop with "Pop-Up" adverts on booting into Windows 8. Then when you get rid of the pop-up an Internet Explorer page will also pop-up to annoy you. www.classicshell.net has a fine free replacement for the Windows 8 desktop start button and menu. Keep away from invasive scamware like Iobit's Start Menu 8. Their Installation menu doesn't prevent this attack to your desktop. Beta version worked.But Version 1.0.0 Final will not show a start button (lower left corner). I now use Start8 by Stardock.com It has many features like app search and all other Windows7 menus, plus other custiomizations It costs $5.00 but this funds developing well researched software upgrades unlike this Iobit StartMenu8 product which is useless if it doesn't show the startup menu. Surely you aren't worried about spyware are you? An old Chrome plated Googleite like you? Maybe if you use IOBIT software a tin hat will protect you? You have posted several links for the paranoid people, seems to me you are one too? Better yet, don't use windows 8. IObit = Nope, not even if I got money for using it.